One of the things that George Redfox talked about on Saturday's downtown Downey historical walking tour was that, in so many cases, Downey's history is buried just under the surface, usually under a layer of stucco or drywall. In this case, the Simply Elegante Designer Fashions shop has recently gone out of business. 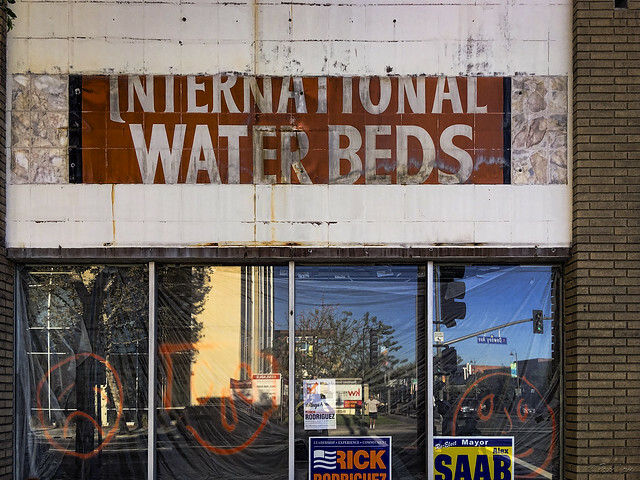 Tearing down the store's signage has revealed another layer of Downey's history—perhaps not as far back as George Redfox envisioned, but at least back as far as the '70s and '80s and the heyday of the waterbed!